NEW ZEALAND, Wellington, October 10, 2018 – Leading games publisher PikPok® in collaboration with Living Dead Media today announced their Night of the Living Dead live event for the hit videogame Into the Dead® 2 will be coming to the App Store and Google Play on October 19, 2018 (NZDT). The event will be available for the limited time of one week only. To commemorate its 50th Anniversary, Night of the Living Dead will screen in over 1,000 movie theatres in the United States, Canada, United Kingdom, Ireland, and Mexico on October 24 and 25, 2018. As audiences experience the 4K restoration of George A Romero’s original zombie horror masterpiece first-hand, PikPok invites players to uncover the hidden prequel story and discover what happened before the events of the film. “I’m an avid gamer and getting to work on Night of the Living Dead with PikPok has been awesome. Anyone who is a fan of Night of the Living Dead or a fan of the genre is going to love this experience,” said Andrew Romero, George A Romero’s younger son. PikPok’s original titles Into the Dead and Into the Dead 2 have amassed over 100 million downloads since the series launch in 2013. In Into the Dead 2, players journey through the zombie apocalypse in a race to save their family. Armed with an arsenal of powerful weapons, players must fend off ever-increasing zombie threats while crossing treacherous terrain. The Night of the Living Dead event follows the story of Ben and his gruelling encounters prior to arriving at the farmhouse. Players will experience the unexplained events of the zombie uprising as they team up with country girl Alice in a fight for survival. 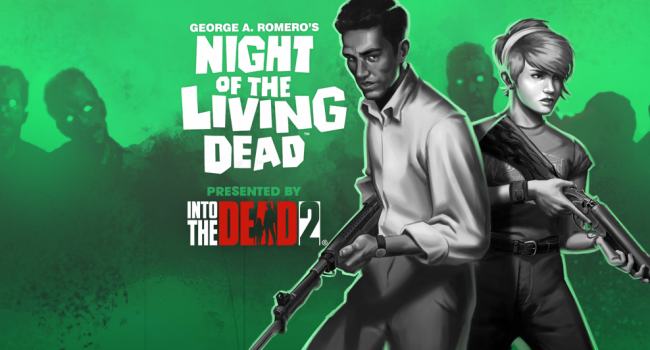 Night of the Living Dead presented by Into the Dead 2 is available on October 19 (NZDT) for download on App Store and Google Play and will run for a limited time until 26 October (NZDT). Living Dead Media is an independent media company operating in Los Angeles, bringing the “Living Dead” to life across the media landscape in 2018 and beyond. Living Dead Media’s projects include partnering with Image Ten Productions and Janus Films in the 2018 worldwide release of the remastered Night of the Living Dead (1968), the upcoming first-ever George A. Romero’s Night of the Living Dead mobile gaming app, and the original film’s never-produced sequel, to be released as Night of the Living Dead Part II (2019). In addition, Living Dead Media has partnered with PledgeMusic to connect Living Dead fans with unique and authentic Living Dead merchandise and memorabilia. For more information, visit http://www.nightofthelivingdead.com and https://www.facebook.com/officialnightofthelivingdead.com.